TRANSPORTATION BOYS CHIC COLLECTION DECORATIVE WINDOWS PANELS 2 PCS (55''x84'') EACH PANELS by JORGE'S HOME FASHION at Epfup. Hurry! Limited time offer. Offer valid only while supplies last. Thank you for visiting my shop! The set includes: 2 X Windows Panels A brilliant product, especially sold and processed by JORGE'S HOME FASHION . Thank you for visiting my shop! The set includes: 2 X Windows Panels A brilliant product, especially sold and processed by JORGE'S HOME FASHION . 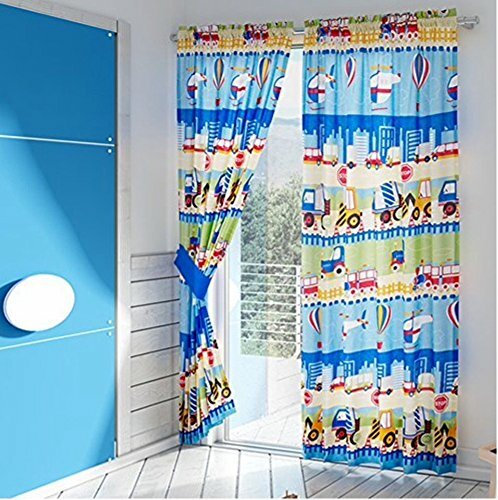 Great Colors in Your kids Room we are pleased to introduce this great quality and fabulous product to you.This can be used as a way of brightening up the appearance of your kids room and this will certainly add a spark, a touch of style and fun. If you want to add freshness and brightness to your kids room, this is certainly the product for you. One of the most majestic and elegant line, known for its softness, elegance and color. The unique design gives the room a touch of freshness and tranquility. Also a perfect gift to give away on a special occasion. *** Visit our store to complete this wonderful collection. If you have any questions about this product by JORGE'S HOME FASHION, contact us by completing and submitting the form below. If you are looking for a specif part number, please include it with your message.